After the feasting last Thursday, our eating spree continued into Black Friday and then again on Saturday for lunch with my Dad & family. The risotto that I talked about here was just too good to pass up again on Saturday (yes, we went back to Marcella’s ;)). 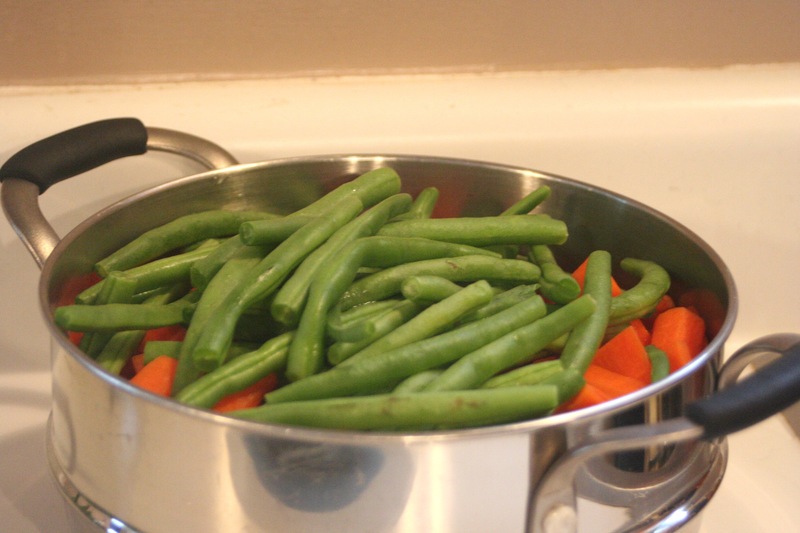 My body was begging to be fed the way it is used to being fed – with lots of fruits & veggies! Of course I enjoy my sweet treats, but not before I eat the healthy (and good) stuff. I feel so much better when I keep my diet full of fresh fruits & veggies. I have so much more energy! Of course another way to stay on track or get back on track after a splurge or holiday is to get right back into your exercise routine. I try to keep my schedule the same or very close to it, so even though I may splurge on some goodies, I am still getting my runs or workouts in. You don’t have to throw in the towel because you overate or didn’t workout for 4-5 days. Just get right back into it! Keep an eye out tomorrow for the start of Cookie-A-Day on Gluten-free is Life. I hope to share a cookie recipe with you guys at least 5 days/week during the month of December. 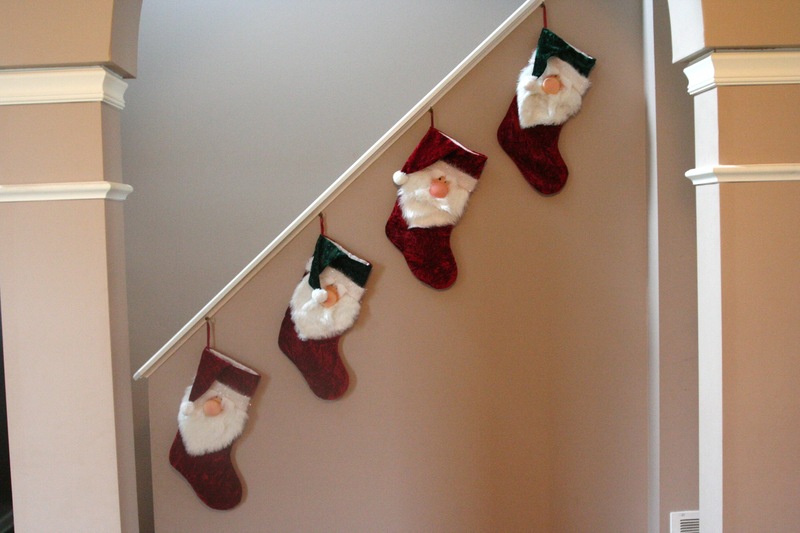 Some will be healthier versions to keep the pounds from piling on this holiday season. I am a firm believer in moderation, though. Don’t deny yourself anything. Life is too short. Denying yourself will make you want it even more & may even cause you to over eat or binge. 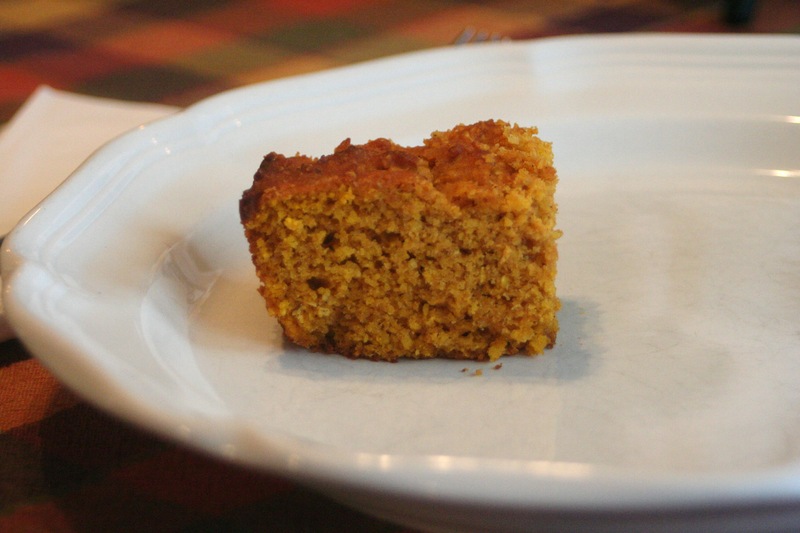 When I first heard of pumpkin cornbread, I was reading Meghann’s blog and thought it was an amazing idea! I couldn’t wait to give it a try. I found the recipe that Meghann used here. Laura of Real Mom Kitchen has some great recipes – including Pumpkin Belgian Waffles that I may be trying out in my brand new Belgian waffle maker that I got on Black Friday!! This recipe wasn’t gluten-free, so I made some changes. The results were impressive! Jon really enjoyed it and has been eating this for all of his meals, including breakfast! Hannah also enjoyed it. I had a piece along side my Thanksgiving meal. It was a very nice compliment. 1. Preheat oven to 400 degrees & grease a 10 inch pie pan or 9 inch square pan. 2. Mix all dry ingredients (except brown sugar) in a large bowl. 3. In another bowl, beat the eggs lightly. Then mix in the pumpkin, brown sugar, oil & molasses. 4. Make a well in the dry ingredient mix and then add the wet ingredients. Stir to mix, being careful to not over mix. 5. Pour into pan and bake for 30 minutes or until the bread is nicely browned and a toothpick comes out mostly clean. 6. Cool slightly & enjoy! I found this freezes well – it tastes just as good when you defrost & eat slightly warmed in the microwave or toasted in the toaster oven. So, now the waffle iron details….$79.99 original price, purchased for $19.99. Can’t beat that! I tried it out last night with Pamela’s Baking & Pancake Mix & Jon had 2 and a half Belgian waffles. Yes, the 7+ inch size. The kid is eating us out of house & home. Oh, then he had some pumpkin pie, as if the waffles (bacon and applesauce, too) wasn’t enough. Recipe for my new POM Wonderful Cranberry Sauce is up on the Examiner. It came out really good! I have been eating leftovers on my salad, ice cream, sandwiches and may have some with cottage cheese for a nice snack tomorrow! I cut the sugar in half and you can’t tell. The week is over (or just beginning). I guess it depends on how you look at it. The busy week is over and a less busy week is starting. It was so great to spend time with family over the past few days, but it is good to get back to the routine. I am worn out. 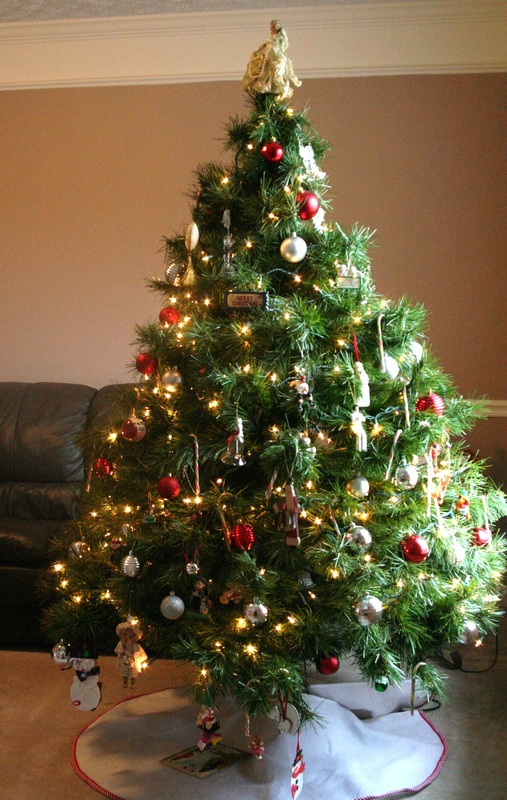 I did manage to get the tree & Christmas decorations up today. My Mom, Hannah and I headed out shopping for some great deals on Friday. We shopped for close to 12 hours. We got some amazing deals, most I can’t talk about due to peeping eyes! 😉 We stopped for lunch around noon at Marcella’s. I am a sucker for risotto, so I ordered the Roasted Chicken & Broccolini Risotto. It was TDF! I thought I liked the Seafood Risotto – I think this Roasted Chicken one might be better! It was the perfect way to refuel. After lunch we hit up World Market & spent close to an hour in there. Not because we were in line, because we were having a blast! I love that place! The only bummer – they were out of their dark chocolate & sea salt bars that I have been dying to try! It was a super fun day! I love spending time with my Mom & Hannah. The only thing missing was my sister, Kelly. 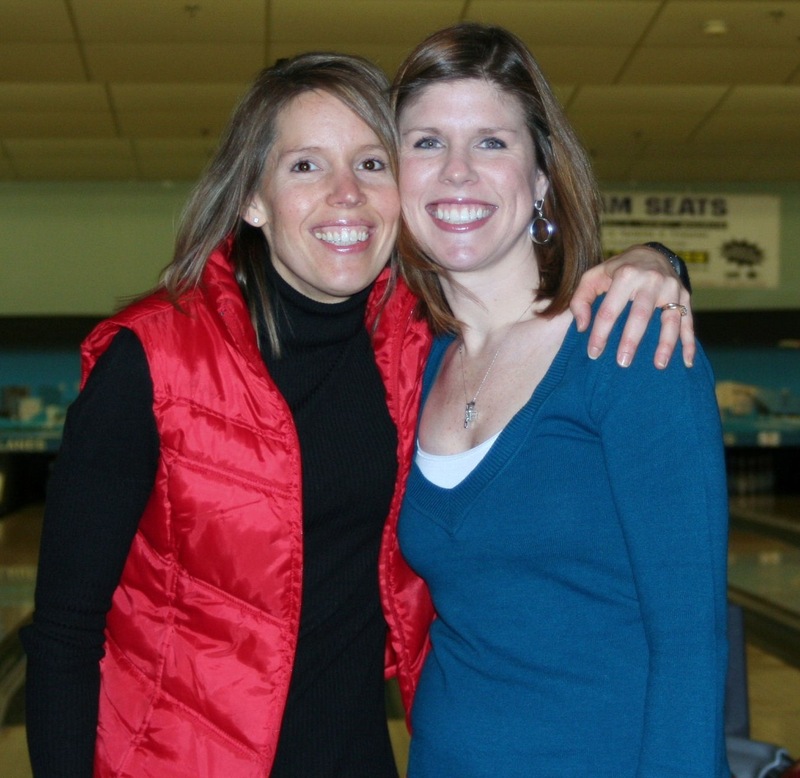 Here is a picture of us together last December. This week Manda of Asparagus Thin is hosting the Gluten-Free Menu Swap with the theme of cranberries. Cranberries rock! I made my own cranberry sauce for the first time last Thanksgiving. This year I added a new twist to that recipe and I will be sharing it later this week. I am also interested in learning how to cook other things with cranberries. 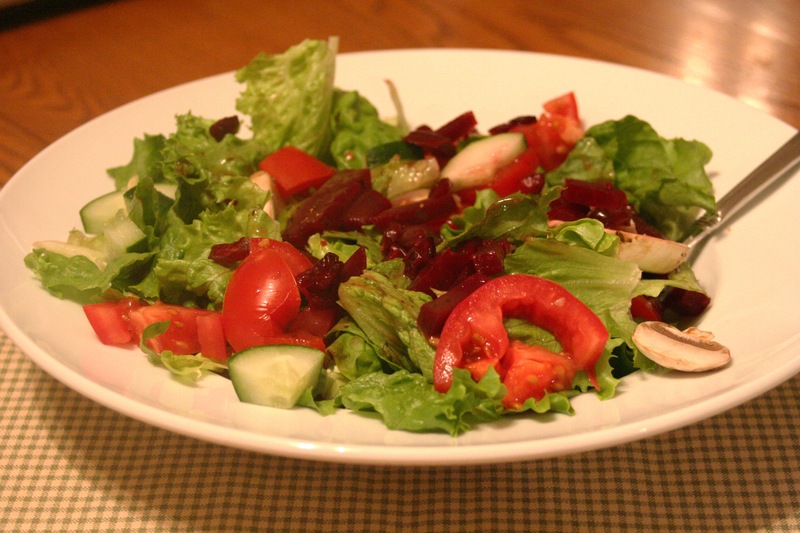 I have been adding the leftover cranberry sauce to my salads….what a great topper! Don’t forget to check out Orgjunkie for lots more menu plans & ideas. Well, a couple days late is better than never, right? The past 2-3 days have been a whirlwind here in our house. Wednesday consisted of running around in circles baking, cooking, chores, laundry and then sleeping. Thursday started with a lovely 6 mile run at the gym. Gotta get that run in to create the calorie deficit that needed to occur before the feast! 😉 LOL! I believe in eating all my favorites & not restricting foods for the holidays because then you walk away feeling deprived. I am not saying I go hog wild, there is a happy medium there. Once my run was complete, then came the cooking. 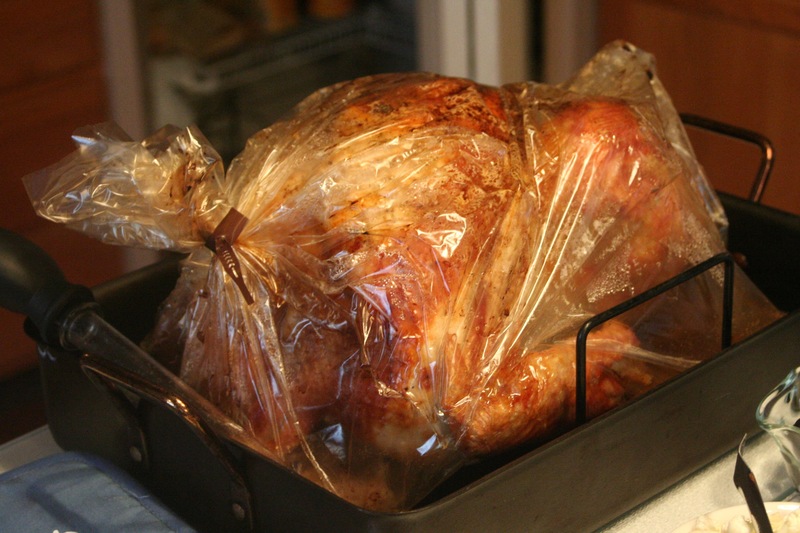 The turkey was prepped & then placed in the oven to roast. 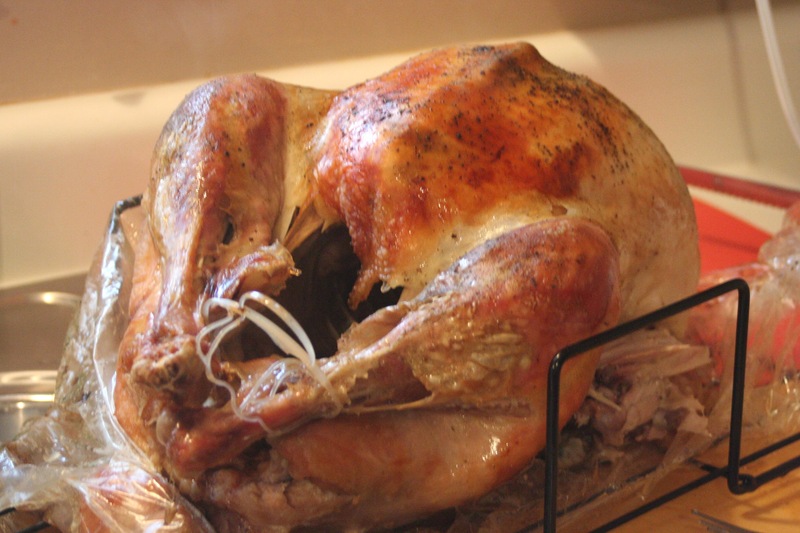 I have to say that we purchased a Meijer Naturals Turkey this year and were disappointed in it. The meat came out very dry despite being cooked in the oven bag. In years past we have only used Honeysuckle or Butterball and it looks as if that is the only way to go. 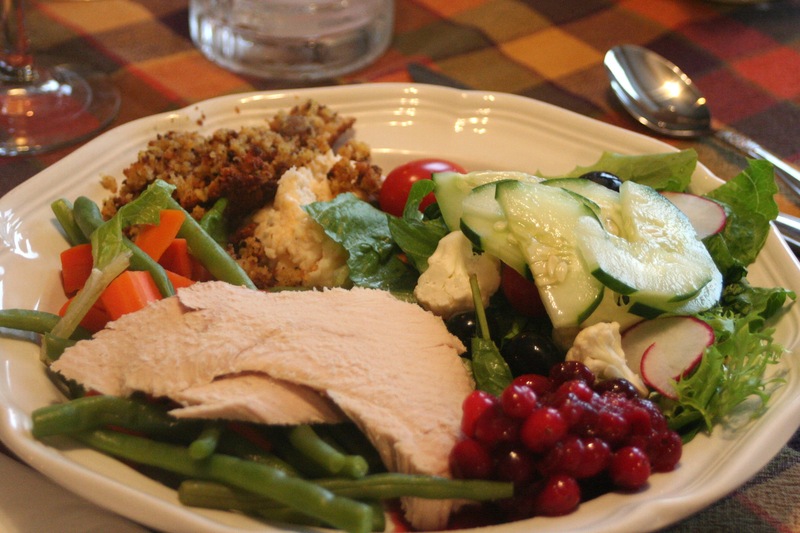 After prepping the turkey, we moved onto the cranberry sauce, stuffing, veggies & salad. Thankfully I had help from my Mom, Aaron & Mary, my mother-in-law. The cranberry sauce was made differently this year. I used POM Wonderful and orange juice instead of just orange juice. Also, I cut the sugar in half. I will post the new recipe this week. We also had come cocktails made with Pom Wonderful, orange juice & Stoli’s vodka = YUM! The meal was awesome! I am also preparing recipes for the Catholic potatoes, cornbread stuffing w/sausage and pumpkin cornbread to go up this week. Did you guys shop on Black Friday? My Mom, Hannah & I went out at 4:30 AM and shopped for close to 12 hours! Lots of fun. I will share a recap & deals in an upcoming post. My favorite is the cornbread stuffing and the pumpkin pie. I love my Grandmother’s pumpkin pie recipe! It is the best! 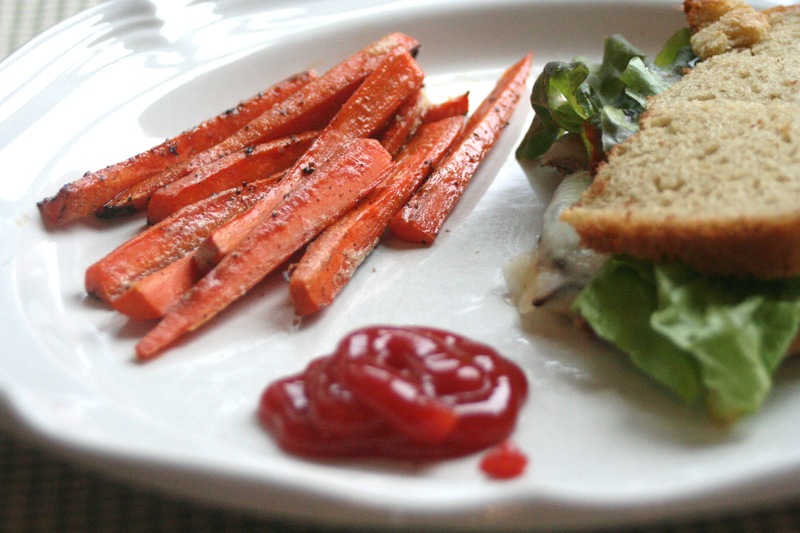 Cheryl at Gluten-free Goodness is hosting this week’s gluten-free menu swap. The theme is Thanksgiving favorites. I listed my favorites above….pumpkin pie & the cornbread stuffing (which is technically dressing, because it doesn’t go inside the turkey). Thanks for hosting, Cheryl! I hope you all have a safe & happy Thanksgiving. Please check out Orgjunkie for lots more menu ideas. As I was blogging about crackers last week, one reader asked if I would talk about gluten-free bread choices. What a great idea! I have reviewed different bread products here over the past year, but I don’t believe I have gone into detail on multiple brands in one post, like a cheat sheet for newbies. So, I am going to do it in this post. I am going to include the breads that I have tried over the past 3.5 years. The first gluten-free bread mix I ever tried was made by Bob’s Red Mill. I can’t remember which one it was, but I suspect it was the Homemade Wonderful Bread Mix. I tried this mix about a month after I went gluten-free. 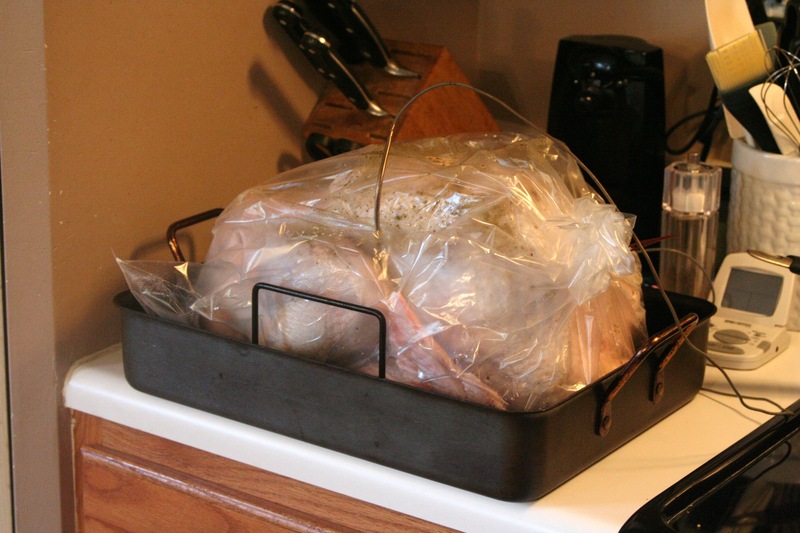 I was so excited when I was making it…the smell wafting through my kitchen was delightful. I couldn’t wait to bite into a piece of warm bread. Well, ummm, I was devastated and may have even cried. I hated it! Now, to be fair, I have not tried this mix since, but have come to love Bob’s Red Mill and their products. Perhaps I was expecting a replica of my once beloved Home Pride Bread. We all know that that will not happen. Looking back now, I realize I was feeling sorry for myself and very bitter about the fact that I was not digging the new diet plan. One of my favorite mixes is made by Bob’s Red Mill – pizza crust! I love this mix so much I have a case of it in my pantry. I need to give Bob’s bread another try. I may try the Cinnamon Raisin or Hearty Whole Grain this time around. Gluten-free Pantry Favorite Sandwich Bread & French Bread & Pizza Mix. These were my go-to mixes before I discovered Pamela’s. The sandwich bread is a great tasting bread and holds up well under the circumstances I need it to (packed lunch). The French bread & Pizza Mix is also a good bread and pizza crust, but the Pamela’s is better. Pamela’s has more depth to it’s flavor and does hold up even better. I didn’t feel like I ever had to add seasoning to Pamela’s when making pizza crust with it, where I did with GFP’s mix. Everyone’s preferences are different, so this may be just what you are looking for. Lots of people rave about these mixes. Glutino Harvest Corn Loaf is a decent bread. It isn’t as good as some of the others I have mentioned here, but it gets the job done. This bread is also found in the freezer section. Ener-G Light Brown Rice Loaf is probably one of the worst gluten-free breads I have tasted. It is a shelf stable product, so I am not sure if that is part of it. Don’t try & eat this stuff untoasted. Toasting makes it somewhat tolerable. I used this bread for a short period of time between Gluten-free Pantry’s bread & Pamela’s. It is easy to transport, but now that I take a cooler on most trips, I bring along pre-made loaves of my Pamela’s. I am not trying to pick on Ener-G. I like their pretzels & use their flours & breadcrumbs to cook with. 🙂 I just happen to not care for their bread. Pamela’s Gluten-free Bread is one of my favorites and is the one we buy cases of on Amazon.com to make weekly. Jon loves this bread. It toasts well and travels well. It can be toasted in the AM for sandwiches & then packed for his lunch box for lunch 5 hours later. This mix is so versatile! You can also make pizza crust, bagels & pie crust with it. You can find Pamela’s in stores all over and online. I buy in bulk at Amazon.com. Kinnikinnick Many Wonder Multi-grain Bread is another one of my favorite breads. This is the closest to rye that I have found, well except the Trader Joe’s Rye-less Rye, but that bread is way too small for sandwiches. This bread makes amazing sandwiches! I also happen to love this bread schmeared with almond butter & bananas for snack! TDF! You can find this bread in the freezer section of your local health food stores, in some mainstream grocery stores and online. Breads from Anna is another wonderful bread mix. I just tried this mix a couple months back & really enjoyed it. Jon didn’t like it as much, but he is a Pamela’s boy. That just meant more for me. It may have been because it has bean flours in it, which also adds protein & fiber. If I could find this bread cheaper, I would probably eat this on a regular basis & give Jon the Pamela’s. 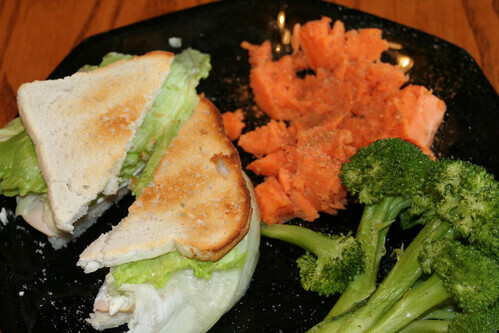 I am editing this post to add the newest gluten-free bread that I have tried – Udi’s. Udi’s is the one & only gluten-free bread that is amazing right out of the bag on the counter. There is no refrigeration required. There is no freezing required. No toasting. Perfect, soft bread. I had to double check to make sure that it did not contain gluten, it was that good. I was finding reasons to make sandwiches when this bread was in my house. I wanted to pack my lunch & go someplace just to say that I could. That I didn’t have to toast my bread first and then eat a cold, toasted bread sandwich. Some lucky ducks are able to find this bread in their local stores or Whole Foods. Such is not the case yet in Ohio, though I can order it online. Speaking of ordering online, it looks as if Udi’s is offering 35% off shipping right now. Bread is $5/loaf or $38 for 8 loaves. I hope that this list helps some of you guys out. I remember those first days and months of trying to eat gluten-free. I remember the frustration & tears. I have taken a bite of something & thrown the rest away. Not only did that leave me hungry, but mad at how much I spent on it. That is why I write this blog. If I can help just one person out, it makes my day. If you have any questions, please don’t ever hesitate to comment or email me. I try to respond to each & every comment & every email, though it may take a day or two. A few weeks back I was contacted by Samantha of Dr. McDougall’s Soups to see if I wanted to sample & review the soups. Of course I accepted! Samantha sent me a package out that not only contained all 7 of their soups, but a great soup bowl, placemat, napkin & napkin ring holder. I was especially excited about the bowl, as I love huge bowls for my salads and this one is just perfect. Okay, onto the soups. 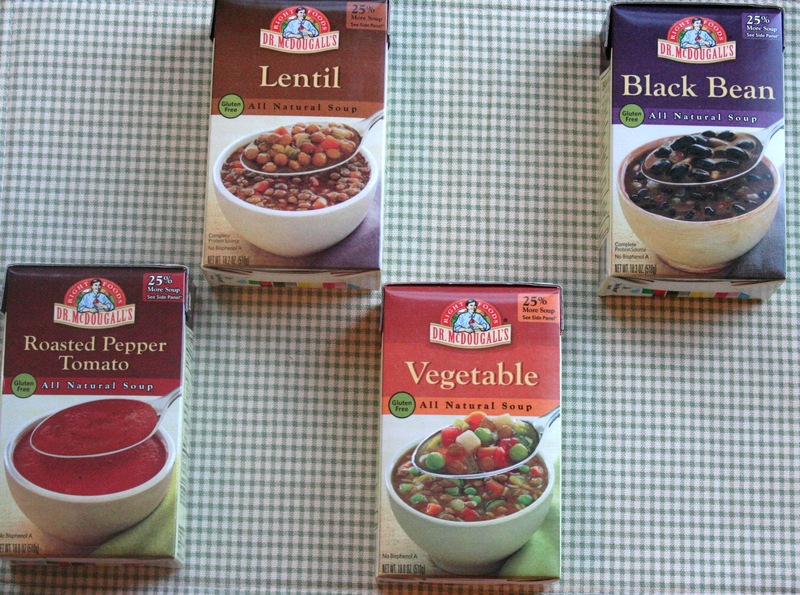 There are 7 different varieties (2 of which are not gluten-free: split pea & minestrone). All of these soups happen to be vegan. The soups I tried were Lentil, Vegetable, Black Bean, Chunky Tomato & Roasted Red Pepper Tomato. All of the soups had a good flavor & I was pleasantly surprised at the amount of vegetables in the Vegetable Soup. Not only were there veggies, but brown rice & lentils as well, which added to the staying power. Jon enjoyed the Chunky Tomato Soup with a grilled cheese sandwich, his favorite combination. Aaron tested out the Split Pea & Minestrone for me. He said they were both not salty enough and were a little on the watery side. Unfortunately I couldn’t taste them due to them both containing gluten. · These great-tasting flavors cater to those with gluten allergies as all varieties, with the exception of Minestrone and Split Pea, are gluten free. All flavors feature cholesterol-free plant based complete protein except Chunky Tomato and Roasted Pepper Tomato. · The soup’s innovative packaging is free of Bisphenol A (BPA) concerns and is made from paper sourced exclusively from sustainably managed forests. They feature innovative Tetra Recart packaging that is recyclable and has a lower carbon footprint than cans. The packages are shelf-stable and never contain preservatives. · The soups are available on grocery shelves for a suggested retail price of $3.29. · Plus, they have 25 percent more soup than most natural canned soup brands. · Until now, carton soups have only been available in broths and purees. The new Ready-to-Serve Chunky Soups are the first nationally available carton soup with whole pieces of vegetables, beans and pasta. Thank you Samantha & Dr. McDougall’s for sending the samples to me to review.